Nigeria has been drawn in Group B of the FIFA Beach Soccer World Cup. The draw took place this morning (Wednesday 1st March) at the Hotel Atlantis in Nassau. 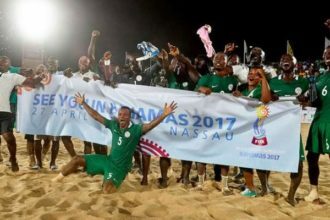 The Super Sand Eagles will slug it out with Italy, Mexico and a yet to be determined AFC opponent. Hosts Bahamas will face Switzerland, Ecuador and Senegal in Group A. The Beach Soccer World Cup will take place in Nassau, the capital city of Bahamas, between April 27 and May 7.